The fairy room was a dreamy project for a 5 year-old girl. Almost everything in the room is custom made. The wooden flowers were designed, cut and painted to create a swag canopy over the bed headboard. Cornices on the windows were upholstered in the purple geometric patterned fabric. The colorful chandelier in the window and custom cushions created a cozy window corner. The nightstand and makeup dresser were antique finds that got paint makeover. 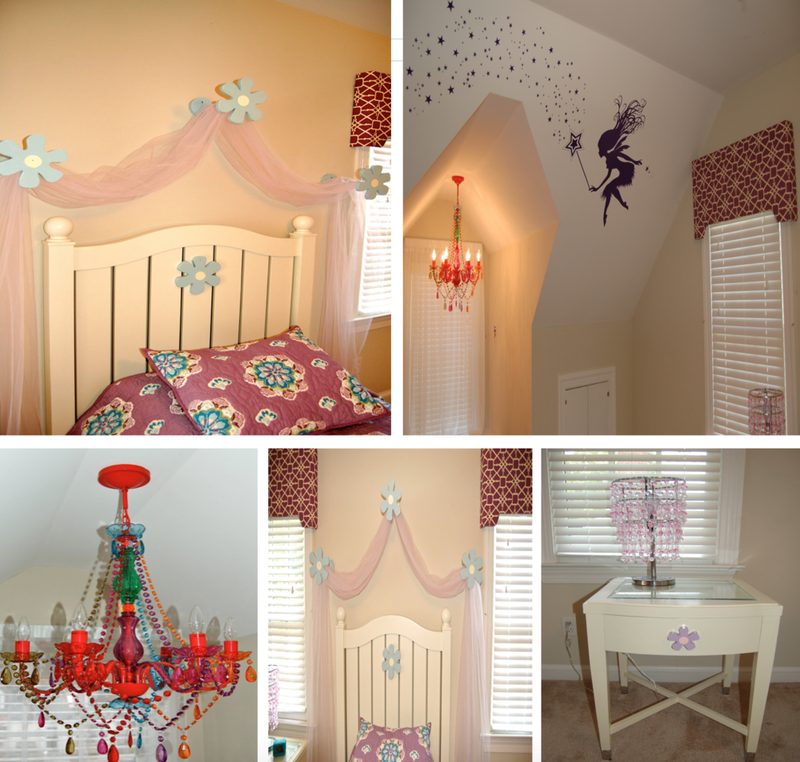 The fairy decal on the wall is purple to complement the color scheme in the bedroom. We made one happy girl. This Basketball room was made for a teenager who is an avid basketball fan. We kept the blue color scheme in the room - on the carpet and window treatments and added a dark navy dresser. The roman shades are in Job Robshaw fabric. There are plenty of basketball hoops, in the form of decal, garbage bin and one on the door. The desk was a makeover from an old black one to a white one with two blue drawers. This room was designed for a teenage girl and as you see from the before photo, we worked around the jade-colored nightstand. The canopy over the bed was installed to show off the high ceiling walls. Matching roman shade in the same jade-colored fabric gave us the custom look. The bench cushion and the pillows in orange-jade patterned fabric completed the design. The bedding is from Pottery Barn in orange-jade-pink color blocks. Oh, the room for little boys, how much fun to design! The transportation theme is showcased in the form of murals in two different rooms. The first room has trucks, planes and trains. The second room is purely a train room, with murals of bridge, tunnels. Blue ceiling with clouds is painted in both rooms, The vehicles, trains and planes are custom enlarged paper designs, that were glued to the wall.